I need to get painting again. I have been so busy working at our Scout Camp and planning a trip tp the UK that I haven't painted in ages. Hopefully I will paint every day of our trip. Yesterday was good. Not great but good. The morning was a bit of a scramble at the start because we had to quickly change classrooms as there were construction people in the loft at DVSA. It took a while to settle down and paint but it went well. Not a great painting because I was rushed and also I used too much water so the shadow of Eddies jaw line all washed away. I am getting more familiar with the new pigments on my portraits palette and that is a good thing. The evening class went well too. Everyone loves Hillview farm and the lighting was perfect. It kept changing which made painting a bit tricky but up until the last half hour or so there was great back lighting on the trees and nice long shadows. Beautiful sky with fluffy clouds for those painting it. A perfect setting for our last class. Catherine said that none of us were ready to graduate so we all had to come back in September. I suspect that most of us will. This painting is all greens but I need practice with them. Especially if I am going to keep painting outside all summer. The greens in the centre tree need to be a bit darker to fit with the trunks but I am pleased with this. I didn't even manage to paint every day for two weeks before I missed a day. A son who is moving out west and an adorable 14 month old grandson who needed to be looked after for a few hours were more important to me. I had a fantastic day with family but do feel really guilty for not painting. It definitely needs more contrast. I spend Saturdays at our local Scout Camp and had some quiet time so I decided to paint. 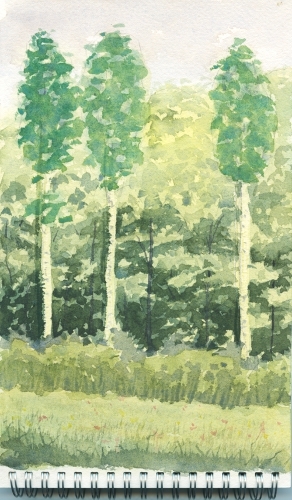 Everything around me was green except the almost white trunks of these very tall poplars. 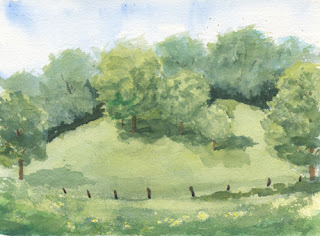 Maybe by the summer I will learn how to put some colour into green paintings. I tried to scratch out the light trunks too early and ended with dark trunks so when I put darker layers on I painted around them. I tried, rather unsuccessfully to mask the dark lines. I am not unhappy with this painting. 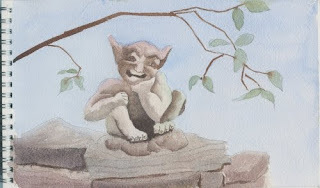 This is a gargoyle sitting beside the creek in our yard. His name is Jackson but I call him "Doug"
He isn't very well painted but I ran out of time. The lilac could have used a few more leaves and he needs to be better grounded. The rocks that he is sitting on should be darker. 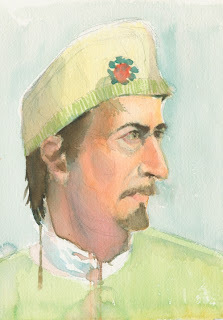 He is probably the strangest portrait that I have ever painted. I have now painted every day for a week. The magnolia after its blooming glory. After the disaster Tuesday afternoon I have become fixated on trees and getting them right, This is better. It too is painted from under our gazebo. It is the magnolia in our back garden. The blooms are long gone but it still has a lot of character with the reds in the new growth. Again painted with no convenience greens. It looks better with the left cropped off but I am posting it as painted. 6" X 10"
This was painted from under the gazebo. 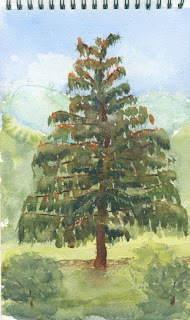 It is our neighbours huge Norway Spruce. It isn't a great painting but my plan was to paint small on decent paper and to just play around with the paint with no thought to composition. 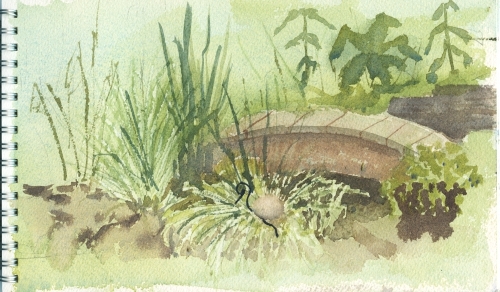 It is painted in a 6" X 10" Arches Travel Book. Does decent paper ever make a difference. I will either stick with the Arches books or start making my own. 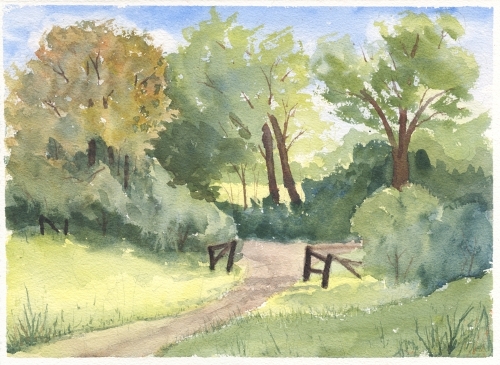 This was painted yesterday afternoon in Catherine Gibbon's "en plein air" landscape class. I am not at all happy with this but I did learn a lot from it. It was an exercise in greens. No convenience green pigments were used. Tuesdays are a painting day. 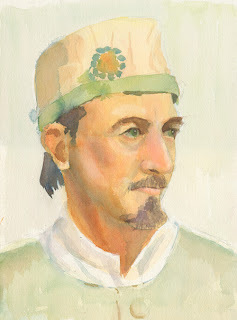 Yesterday morning was Katherine MacDonald's portrait class at the DVSA. I have stopped using any opaque pigments except at the very end of my paintings in an attempt to keep them clean. I have been struggling with the characteristics of the more staining colours but yesterday it seemed to come together. The portrait isn't perfect but I am pleased with it. With a little more time I would have worked on the hat broach and feather a bit more. The photograph of the model was taken after the painting was finished. Do simple 5" X 7" pages in my journal really count as paintings? 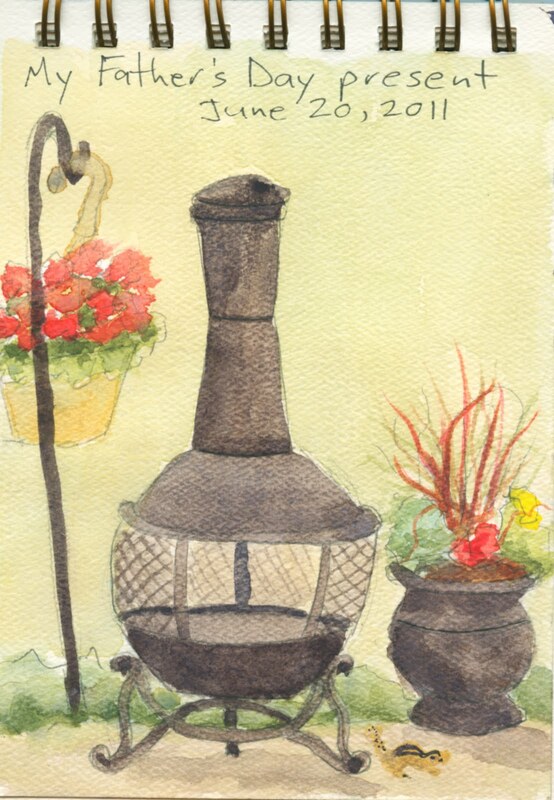 Yesterday was Fathers Day and I received a chiminea as a gift which was really cool because Debbie has wanted one for ages. It does look good in our yard and it did give me something to paint. I wonder how long I can go doing paintings from inside our gazebo. Probably quite a while. The little guy under the planter on the bottom right corner is Hoover. Hoover and his buddies Bissel and Kirby are chipmunks who do a great job of vacuuming up any seed that the birds spill out of our feeders. Day 3 and struggling on. I need to find some journals with decent watercolour paper. Between the cheap paper and the hot dry sun today was another struggle. My washes are a bit splotchy and the corners of windows and shadows aren't as square as they could be but I am not totally unhappy with this. 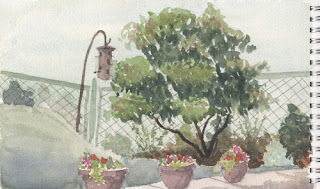 I am certainly enjoying taking the time to sit outside and paint. 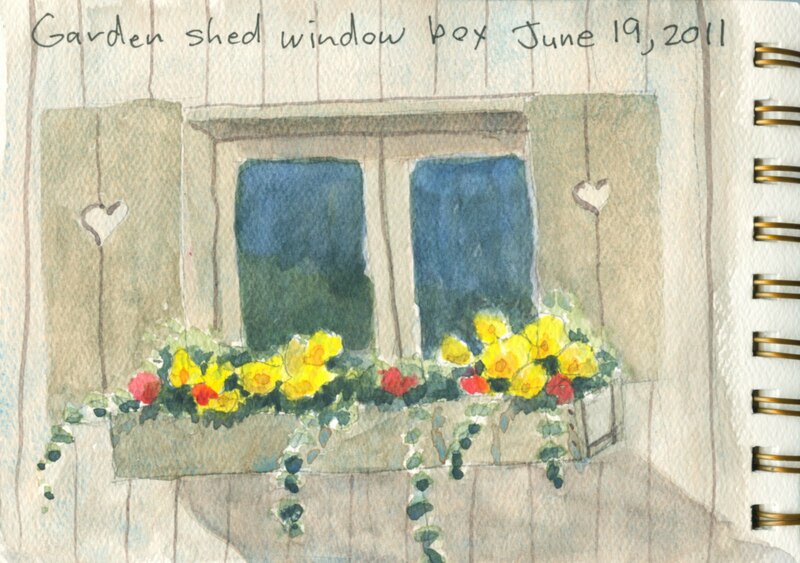 I may go back in and add a bit of sienna to the window box so that it isn't exactly the same shade of gray as the shutters, windows and shadows. Or I may just play with my grandson. Yup! Jack trumps painting. There is a reason that I don't paint flowers. This is one of my worst paintings in a long time. The fact that I worked in the hot sun before I started painting and then sat in the sun to paint probably didn't help. I did learn a lot though. Before we go to Britain I need to invest in some journals with decent paper. This ended up almost all one value and the contrast between greens and reds didn't add the variation that I had hoped for. I grayed my greens too much. I needed to do a better job of retaining my lights. Scrubbing out isn't much of an option on cheap paper. 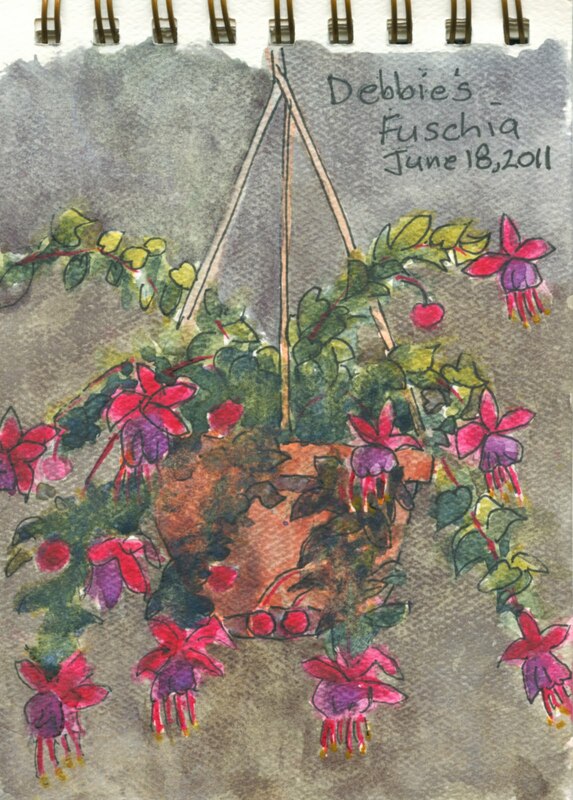 In real life the fuschias are a brilliant rose and mauve colour. I have now painted for two days in a row. I am on a roll. I have started taking my art more seriously. 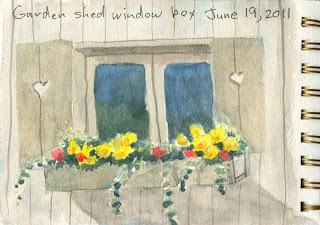 I intend to start a journal and attempt to paint in it every day. There is no way that I can possibly paint every day so the purpose of this blog will be to keep me honest. It will become obvious to me and anyone who cares to look in if I start to slip badly. Debbie and I are going to Britain in September and I need to have a travel painting kit finalized before we go. This process will be a tune up. I have kept a sporadic watercolour and ink journal in the past and hopefully this blog will push me to keep it up for an extended period. I hope to do a journal page on days when I don't work on a painting. I am off to start my first journal entry. Debbie's garden is my favourite place to sit and chill. There is enough to paint here to keep me going for a long while. 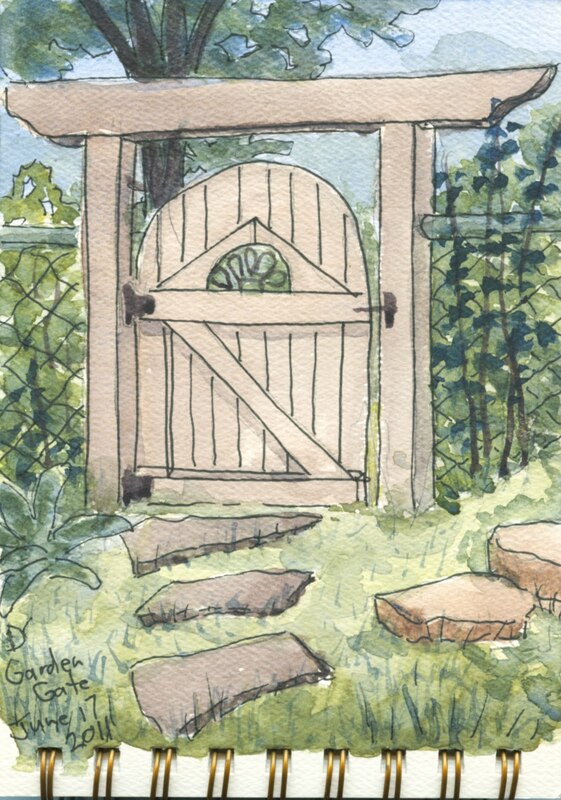 I thought it only appropriate that I start this with an "Entry" so here is the Garden Gate. Watercolour and ink in a 5" X 7" watercolour journal.